Tokyo lives in a small house between giant buildings with his family and his cat, Kevin. For years, highways and skyscrapers have been built up around the family’s house where once there were hills and trees. Will they ever experience the natural world again? One day, an old woman offers Tokyo seeds, telling him they will grow into whatever he wishes. 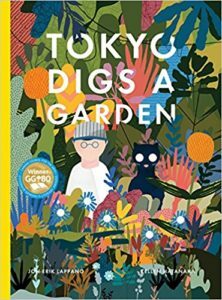 Tokyo and his grandfather are astonished when the seeds grow into a forest so lush that it takes over the entire city overnight. Soon the whole city has gone wild, with animals roaming where cars once drove. But is this a problem to be surmounted, or a new way of living to be embraced?